Porta Nigra in Trier is a unique historical monument from the Roman era, which today represents a unique relationship of the modern German city of Trier with its historical past. 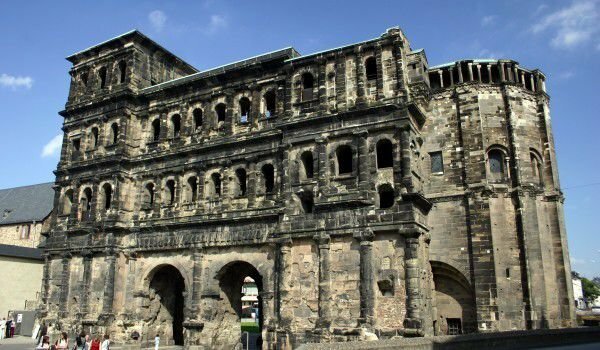 The extremely well preserved Porta Nigra is arguably the most historic landmark in Trier, and the largest Roman gate, which can be seen north of the Alps. Trier is considered the oldest city in Germany and as such has a rich history that has left generations of these amazing monuments. Porta Nigra in Trier is included in the list of world historical monuments of UNESCO, together with the Cathedral in Trier, which is considered the oldest Catholic church in the country. Porta Nigra is the oldest defensive structure in Germany. It was built about 180 years AD when the entire Roman town was surrounded by fortified walls. In those ancient times Trier became a Roman colony from 1st century and early second century established itself as a major commercial center of the field. Trier led by Fortress Porta Nigra then became one of the capitals of the Roman Empire around the end of 3rd century and also became known as, Second Rome. Porta Nigra is one of four Roman gates, which can still be seen in Trier. Along with the other three they are spoiled because of the stone blocks and steel in their structures. The very name of Porta Nigra, meaning black door, comes from the Middle Ages, when the inhabitants of Trier had named it so because of the dark color of the rocks from which it was built. Porta Nigra unlike the unhappy fate of the three other city doors, remains intact, because it was used as a modest residence of a hermit monk named Simeon for seven years between 1028 and 1035. After the death of monk Simeon, Porta Nigra was converted into a church on two floors and named after St. Simeon. The upper floor of the Porta Nigra was used as a worship sanctuary. With the advent of Napoleon around 1803, the church in the Porta Nigra was destroyed, with any part of the very structure of the Roman gate. However, later Porta Nigra had been restored, which was during the Middle Ages. Porta Nigra impresses with its structure. It is only built of sandstone blocks, backed by metal bars. No mortar, but each stone block weighs up to about six tons. The length of Porta Nigra reaches 118 feet, to 75 feet wide, and the whole building has a height of about 90 feet. Today Porta Nigra has the museum of statues where visitors can see the remains of the former monastery of St. Simeon.